Hurd and O’Rourke reach Washington, D.C.
Two days after their cross-country road trip drew national attention, Texas U.S. Reps. Will Hurd and Beto O’Rourke signed on to legislation one another is working on. 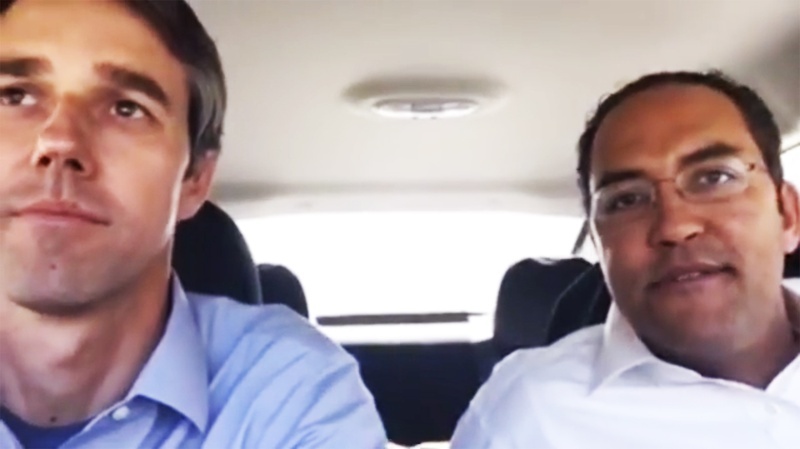 After spending two days in a car together, U.S. Reps. Will Hurd and Beto O’Rourke showed Friday their bipartisan road trip was not for nothing. Back at the U.S. Capitol, the two Texas congressmen signed on to legislation one another is working on, with Hurd, a Helotes Republican, lending his support to a cause that usually divides his party and Democrats: immigration. He became a co-sponsor on O’Rourke’s American Families United Act, which would let family members of U.S. citizens who are barred from ever re-entering the United States on a technical issue to go before a federal judge to decide if they can return. For his part, O’Rourke added his name to Hurd’s American Law Enforcement Heroes Act, which would make it easier for local police departments to hire veterans. Hurd is collaborating on the bill with U.S. Sen. John Cornyn, R-Texas. Like their road trip earlier this week — which began after winter weather derailed Hurd’s flight back to Washington — the event Friday was livestreamed and put on display their budding friendship. After signing on as co-sponsors to one another’s bills, they exchanged gifts. O’Rourke, who is of Irish descent, gave Hurd a green tie because he was not wearing the color for St. Patrick’s Day. Hurd gave O’Rourke a framed map of their initial route to Nashville that Hurd had drawn. Hurd and O’Rourke reach Washington D.C.
U.S. Reps. Will Hurd and Beto O’Rourke — a Republican and a Democrat from Texas, respectively — arrived at the U.S. Capitol Wednesday, ending a two-day trek from San Antonio that drew thousands of fans. The road trip is over. U.S. Reps. Will Hurd and Beto O’Rourke — a Republican and a Democrat from Texas, respectively — arrived at the U.S. Capitol just before 5 p.m. Wednesday, ending a two-day trek from San Antonio that captivated the country and brought more attention to the two congressmen than ever before. After a snowstorm derailed their plans to fly back to Washington on Tuesday, the two rented a car and livestreamed the 1,600-mile drive, answering questions from commenters along the way. They billed it as the longest continuous bipartisan congressional town hall using the Facebook Live platform. The two pulled into the Capitol parking lot ahead of schedule — they had aimed to be there by 5:30 for a series of votes. They were greeted by a man holding a Texas flag at the security gate and then a throng of reporters and staffers at the bottom of the Capitol steps. “If I start being mean to him right now, it’s because of separation anxiety,” Hurd joked as the two emerged from their Chevy Impala, almost immediately seeking jackets to cope with the cooler northern weather. The road trip exposed many from outside Texas to the two congressmen, who have kept relatively low profiles in the state’s delegation until recently. O’Rourke is close to announcing a challenge versus U.S. Sen. Ted Cruz, R-Texas, in 2018, and Hurd, whose district spans hundreds of miles along the U.S.-Mexico border, has emerged as one of his party’s most notable critics of President Donald Trump. The trip also came at a time when members of Congress, particularly Republicans, are facing heightened scrutiny over their accessibility to constituents. Texas Democrats did not let Hurd off the hook for the trip, arguing it was not an excuse to not hold an in-person town hall back home. Hurd and O’Rourke nonetheless received bipartisan support as they made their way to Washington, fielding phone calls from dozens of their colleagues in Congress, including Texans such as GOP U.S. John Cornyn and party leaders like House Majority Leader Kevin McCarthy. Hurd and O’Rourke asked many of the callers which member of the opposing party they would choose to go on a road trip with — U.S. Rep. Henry Cuellar, D-Laredo, was a popular choice among Republicans. There were also lighter moments. They found common cause after their orders Tuesday at Whataburger were switched, with Hurd discovering he doesn’t mind onions and pickles on his burger after all. When commenters weren’t asking questions, they peppered the two congressmen with travel advice. That brought them to Gibson’s Donuts in Memphis, Tennessee, late Tuesday night, where they stopped before sleeping over in Nashville. Among the final questions they got as the National Monument appeared on the horizon: Would one of them drive the Impala back home after this week? “I’m going to pass on that one,” Hurd said. The Texas Tribune is the only member-supported, digital-first, nonpartisan media organization that informs Texans — and engages with them — about public policy, politics, government and statewide issues. The Texas Tribune thanks its sponsors. Become one.